I'm so proud of us. And as I typed that I honest to goodness got the chills. We are all doing the best we can. Sometimes Life is very complicated and confusing. It takes so much work. We have to remember so many things...make a dentist appointment, pay the cell phone bill, passwords for online banking and email and gate codes or pin codes... Sometimes I think smoke will start billowing from my ears and I will short circuit. We have to work really hard to remember what matters. May I tell you something? You are enough. You are more than enough. I see you, in your bed, in your room, in your car, on your porch, on your couch. Reading my words. I am sharing them with you, so actually they are OUR words. And so often we doubt ourselves. We wonder if we are taking the right path. We wonder why we aren't doing better or more or perfecter. But all we really have to do is wake up, do good things, breath in and out and try the very best we can for that day. Every day is a fresh beginning. I'm still new to this whole- because I write about my life and give you an intimate and genuine glimpse into my home, feel free to throw any opinion you have my way- stuff. It's not how I was taught, it's not how I will teach, and it's not what I do. I got a comment today on Facebook. I'll paraphrase because it was pretty long. Is it too harsh to ask you to move past talking about the Garbage man? Your writing about it over and over and over and over and over (there was actually a total of 3- THREE separate over and over agains) is like trying to recreate the magic that was in the first article and you really just need to love it for what it was and move on. Woah...and I thought the Poor people and mixing cheese quote was bad from Princesses: Long Island. And tonight as I sit down to write, I laugh at myself. Here's the deal. I absolutely do not lead a glamours or slightly exciting life. Sometimes I get so bored with my Life I think I'm going to diiiiiieeee. The most exciting part of my day. Getting cupped in Physical Therapy. My day to day is Physical Therapy, Speech Therapy, and Behavior Therapy and driving to and from. Most days I am tied down to my house while the boys are doing in home Behavior Therapy. Doodle at speech late this afternoon. Both my little dudes put in Investment Banker hours working hard to navigate this world. Boy am I lucky all of these resources are available to me and my boys. I am beyond grateful for the people that teach my boys, for the state that provides some of these resources and to God for giving me such a beautiful project to manage- Greyson and Parker. Picking the boys up from therapy. Thursday mornings they do Behavior Therapy outside the home. When I first enter a room I have to break into Greyson's world before he realizes I am there. I do not go to fancy parties. I do not travel outside of California. I do not go to a job during the day. I feel like a Golden Girl because I rarely even drive at night. My week days do not involve going to the zoo, the water park, or even on play dates. I'm putting my own photography career on a shelf now because this blog is currently my part time job. When I really think about it, sometimes I can't believe I have a single thing to write about. Our weird little world is beautiful and unique though. 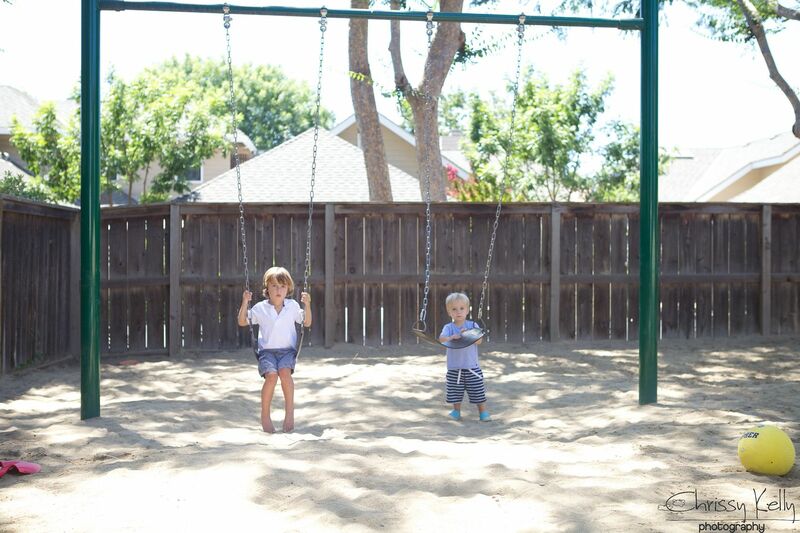 We stayed at their school for a little while so we could swing. 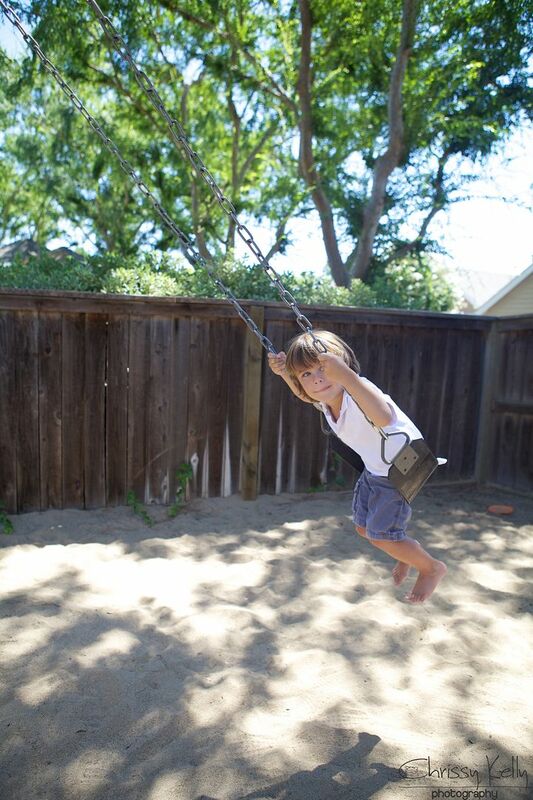 When Greyson swings, he comes alive. I feel him with me. We share the same space. It's kind of the greatest. But at night, I share my heart with you. My words travel the globe. 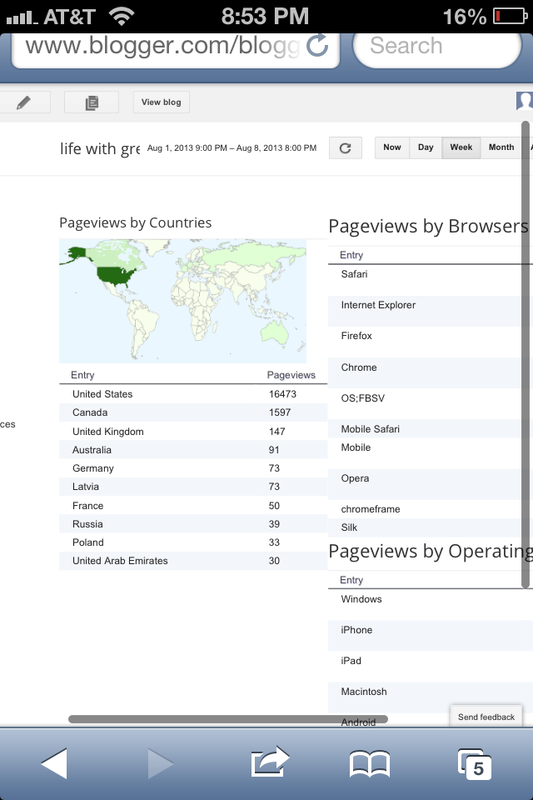 Here are our pageviews by countries for the week. When I write, I share my day with you. I share my musings on Life and love and fear and shopping and autism and sadness and God and people and goodness. It is intensely personal and uncensored. And if you love me, if I am your people, I am so glad we found each other. But if you have something to say that isn't kind or productive, I just can't afford to hear it. I'm so proud that my skin is getting thicker, but those comments still hurt me and distract me. I've hurt enough, Friend. Hurting is the downside of being so intensely emotional and expressive. When I get an unkind comment I feel like saying- Let me into your home and your life. Let me witness you doing the work of your soul, so I can then criticize you --so you can see how horrific it feels. And, here's the deal. God sent me the gift of Frank to my actual home- like a UPS package, because He knows I am here doing very important work, He knows I can't leave, and He knows I need inspiration and reminders of just how good people are. Yesterday Parker spontaneously gave Frank a kiss and the look on Frank's face is making me cry right now as I type. We have no family here, and honestly, Frank feels like family. And Frank is not a news story. Frank is not the garbage man. Frank is a blessing from God and a recurring role and Family Friend now. There's a pretty good chance I'm going to write about him every Wednesday. Author Byron Katie says, It is not your business to love me. It is mine. So I continue to work on loving me, just the way I am. And I realized today, that I grew. I get some of the most beautiful and amazing messages from you and I am changing the world for my boys and for anyone that needs it too. That's what is important. A very special blog reader Friend surprised us today with an extremely generous Gift Card to Jamba Juice for the boys. Thank you so much sweet B. People are so incredibly good. I am so honored every time I get an email from a Mom the night before going in for an autism evaluation. She is so scared and I remember that feeling so vividly. I so desperately hope my words help. 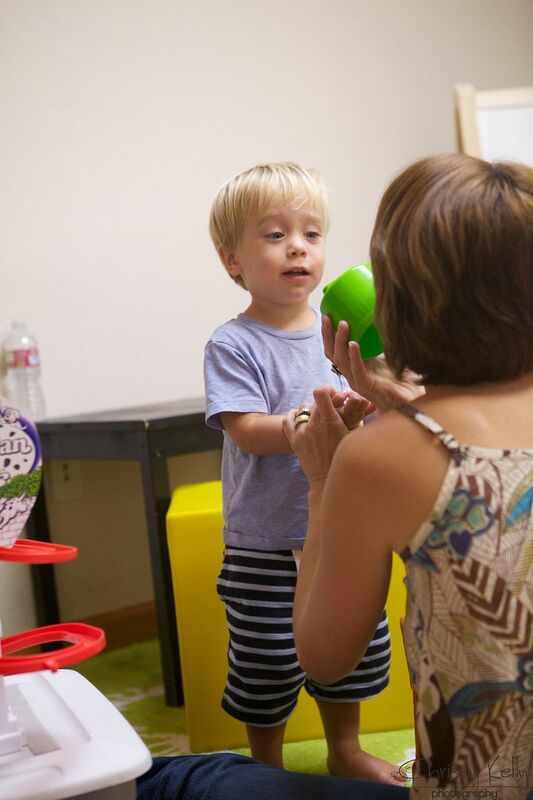 I hear from Moms reeling after they hear those horrible words, Your child has autism. These emails are very sacred to me. No matter what I am doing I make sure to write back. I do my best to hug them and listen via email. I hear from you with typical children who just GET it, how exquisite and excruciating life is sometimes. I hear from those of you without children. You don't need to have or do or be anything to come here and connect. You just have to feel. You are so amazing. You make me cry. You show me more goodness and kindness than I ever knew was possible. I honestly love you. So because of you, and because of who I am and who I want to be- I'm not going to talk anymore about the wonky comments I so rarely receive. I just wanted to talk about it today because it was on my heart. I'll leave you with the true words of author Miguel Ruiz. Be impeccable with your word. Don't take anything personally. Don't make assumptions. Always do your best. I love YOU, Chrissy! And how fun that someone sent a giftcard to you! A break from the house for you and the kiddos, to eat something cool and yummy- FOR FREE! :) I cannot believe how far your blog has spread! Thank you for sharing that screen shot. Amazing! Keep writing and we will keep reading! Oh- and btw, the pic of the kiss was adorable. I just recently discovered your blog and now read it every day! I don't have a child with autism, but I have a child who was born with lots of medical problems, so we've been through the therapies, the developmental delays, and surgeries (too many to list). This journey has changed me, on so many levels. And for the good, I would like to think. I can relate to so much of what you write about. I agree about the negative comments. There is no room for those in our lives! Please don't let them get to you. As Joy said, keep writing...and we will keep reading! Chrissy, I look forward to reading your blog every day. My grandson is autistic. My daughter is another amazing mother, like you. These children are truly gifts and everything that they do is a BIG deal. So, if the reader that doesn't like hearing about the garbage man story doesn't understand, then maybe she just needs to read another blog. Because I love hearing that story. I got a video yesterday of our grandson for the first time, climbing up the big steps and slide by himself, and I watched it at least a dozen times. And I'll probably watch it another dozen times today!!! Please keep sharing!!! And have a great day!!! I stewed about that comment all day yesterday. I kept meaning to come back with a second comment, but never made it. However, what kept going through my mind was this: In addition to any Frank mentions being welcome reminders of the good in our world, I think your mentions of Frank can also serve to remind all of us that we are called to BE a Frank to someone. Hopefully to many someones. We only need look at the impact Frank has had on Greyson (and Chrissy) to see what "being kinder than is necessary" (name that book!) might mean to someone. As the mother of a teen with Asperger's, I shouldn't need that reminder...but I do. Surely others can benefit from it as well. Write on, Chrissy; write on. I'm a mom of two "typical" boys, but I look forward to reading your blog every morning and following along on your journey. I was especially touched by your story with Frank, so don't you dare stop writing about it over and over and over (and over) again! Whether our children have super powers or not, we are all struggling with something, whether it's our fear that we're doing something wrong that will scar them for life, or the mind-numbing everyday routine that can sometimes make us feel like our former lives as "real people" are a million miles away. I read blogs, yours included, to remind me that we are all connected by being mothers. It is the best club in the world to be a part of. Thank you for sharing your beautiful life with us. It's YOUR blog. It's YOUR life. And clearly others are fascinated with its ups and downs, as your readership grows and grows and grows and grows and grows (take that, over and over person). I wish people wouldn't feel like it's their right to tell you what to write about, as lots of people are finding comfort in what you write. I have a son with "general developmental delays" (what does that MEAN??) and when he's losing it in a public place in an inappropriate way, it's helpful to remember that other parents deal with this, that I'm not alone. And for the parents that don't, maybe they're reading a blog like yours and instead of shooting me daggers with their eyes because my kid can't keep his cool, they're feeling some compassion and understanding thanks to a window they've been given into these kinds of challenges. For every negative comment, I hope you get 100 positive ones. I've been reading since you were featured by Glennon on Momastry. After reading today's blog I had to be one of the positive messages you hear. Often you are one of the first things I read at the beginning of the day. Your positive shining outlook gives me thoughts for the rest of the day. I absolutely want to hear further stories about Frank. You take simple day to day occurrences and appreciate them. Thank you for being you every day. Chrissy - The world IS a sad place when someone tries to take the beauty out of your words and does not truly appreciate all that you are sharing with the world. I LOVE Frank! I LOVE the goodness that Frank has brought into your life! I LOVE hearing about Frank and how he is bonding with you and your children....after all, we can NEVER have too many friends or Franks in this world. Chrissy, keep up the good work you are doing in this world and write about whatever is in your heart. It's a person choice to read your blog, and if they don't like it...then don't read it! I choose to read! Sorry if I was harsh, but it upsets me to know that someone gives you negative feedback on something so wonderful that you are sharing with all of us! Amen Sista! Makes me think of Glennon's quote she posted,"If you're not kind on the internet, then you're not kind." Love you Chrissy! Keep your chin up! I love Frank. There, I've admitted to loving a man I've never met. People like him, like you, like your boys, and husband, make a difference. You all show that good that is in the world. I need that. We all do. The blog world is much like tv, if you don't like what you see, change the channel, don't complain. I always feel for people who make those sorts of comments, they must have difficult lives that have lead them to being an upset sort. The reason I love your blog is because you write from your heart, it's right out there, in the open and it should be respected as such. It is a rare thing for someone to put their whole selves out there such as you are. Please do not let those types of comments tear you down. Not even a microscopic piece. You bring so much goodness to my day. And to the days of many. We love you! Keep moving ahead. Ignore the detractors. They will always be there. In real life and on your blog. No matter what you disclaim. So just put on a Teflon super power shield and let them bounce off of you. Friend, with all due respect, you make my heart super happy :)Bravo to you for standing up and saying No more wonky comments! And just because you are sharing yourself & family, doesn't give anyone the right to make hurtful comments. I hope the commentor has a realization about the harm thoughtless words make & I hope she sticks around this place. We are all here to learn & sometimes experience is the best teacher. I know I have spoken unthoughtful words before that resulted in hurt feeling and I hope I have learned from that. 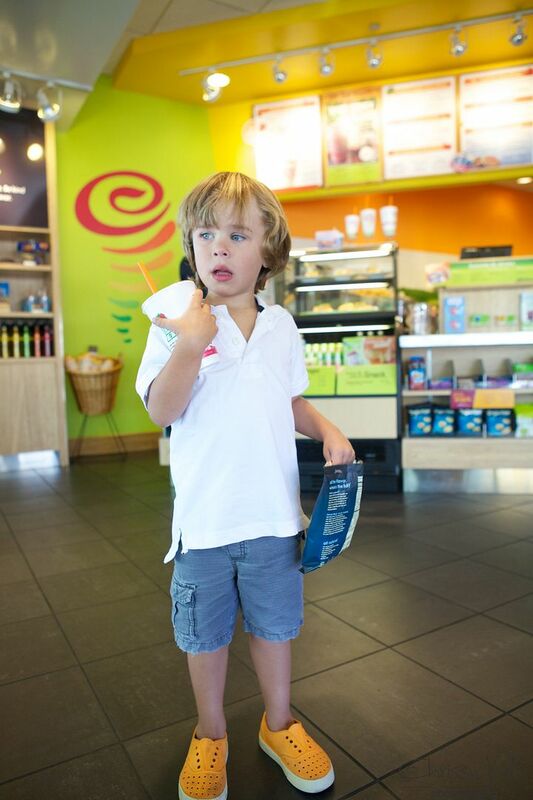 Hooray for you & hooray for Jamba Juice & hooray for Jamba Juice gifting friends. I just found your blog! I love how you are so honest. It is refreshing to hear how life is not the so called definition of perfect, but perfect for us. 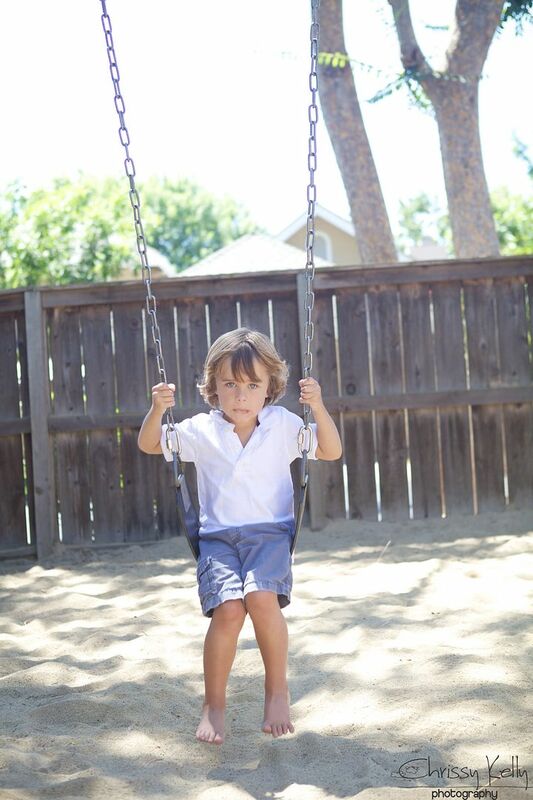 I have an autistic nephew...he has the most beautiful blue eyes...just like greyson. When he smiles it means the world...when he hugs, it is like nothing else you have experienced. I sent your blog to my sister...I only hope she feels as connected as I did. And for the record...I will be looking forward to hearing about Frank next week. Love your blog. I have two kiddos and am an educator and I just love how you see the special in everyone. I love reading about your boys and the way you make the mundane just beautiful. My hope is that I'll grow just a little more to be like you! I love your blog. You have a way with words. You can tell they come from within, way down. I am a mother. I understand. Thank you for sharing your world. I also don't think you have "put you photography career on hold". The photos you capture of your boys and your adventures are beautiful and make a wonderful portfolio. I love looking at them (and i love how you dress your boys-equisite taste you have). A want to give you a big hug and aply to be your "best friend", but i am way over here in Boston, MA. Thank you, for being you. Kristen @ One in 1 Hundred. Okay, you're one of three blogs I read every day. Your words are so inspiring and powerful. I constantly say to myself, "Wow! That's powerful! ", after every paragraph you write. You are definitely a kindred spirit to me. I too "feel" more than most and have always tried to hide that part of me. This is my first time ever commenting on one of the blogs I read where I don't actually know the person. I too have a blog and two little ones and so wish I could be as honest as you. I just simply don't have the courage. And I don't feel quite free because of it. I'm sorry people choose to write negative comments to you. Please know that those words have everything to do with them and nothing to do with you. Please continue to write and inspire the world. We're here, we hear you and you're doing so much good! The world needs more of you! Life does not always proceed like we planned or like we think it should. Frank is a gift from God for your family. 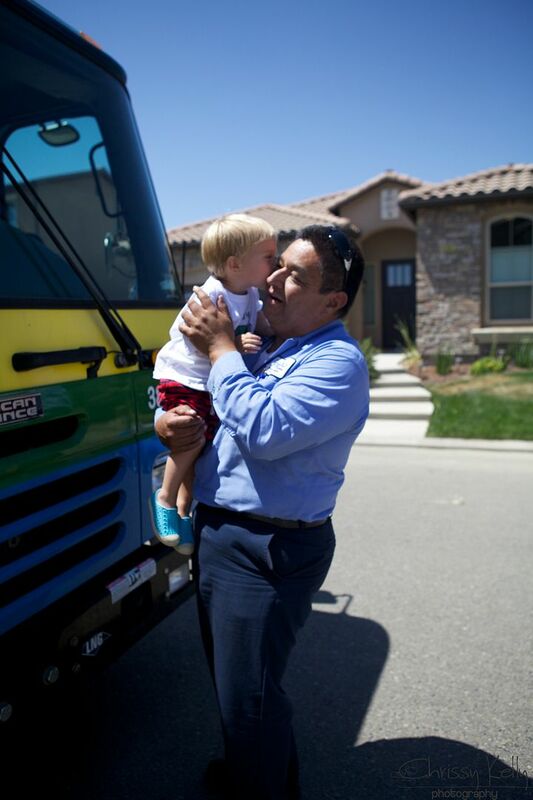 Angels are everywhere and yours just happens to drive a garbage truck. Luckily, you stopped and listened to the message you were sent through Frank. Raising children is a bumpy road that is sometimes marvelous and sometimes terrifying. It is YOUR blog and everyone has a choice to read or not. As another reader said- carry on. I just want to say that I love you. I read your blog for the first time after a news story. A friend from Indiana posted it on facebook and I was shocked to see it was a story from my hometown. I really admire you for how much you've put yourself out there. I struggle a lot but I feel like i can't share my struggles, because i don't want to sound ungrateful or incompetent or lazy. Most of the time, things are HARD, and some days I want to just hide under my blankets and eat chocolate instead of taking him to the potty, or doing music time, or cleaning poop off the walls. I appreciate you letting us into your life. Not everyone can write so its nice when someone can express what you can't. My three year old is lying next to me and she wants to know if she can be friend with Greyson. She goes to speech therapy and saw his picture at therapy. She said if she met him they would eat frozen yogurt and say "Nice to meet you!" My thoughts on what the writer said in her email, this is your blog, not hers. If she doesn't like what you write, she doesn't have to read. Here, this place, is where you bare your heart and soul for your readers. You write what is important and has meaning to YOU. You write about what hurts you, makes you happy, makes you feel whole. Frank's presence in your life, and the way he impacts your sons, make you feel whole. It makes you feel a little bit less of the monotony in which you must endure daily life. When you write about him, it makes my heart happy because I can feel, literally feel your happiness, can sense the balm being laid on your heart, as it comes out in your words, and I'm sure I'm not the only one. Chrissy, this is the world through your eyes. 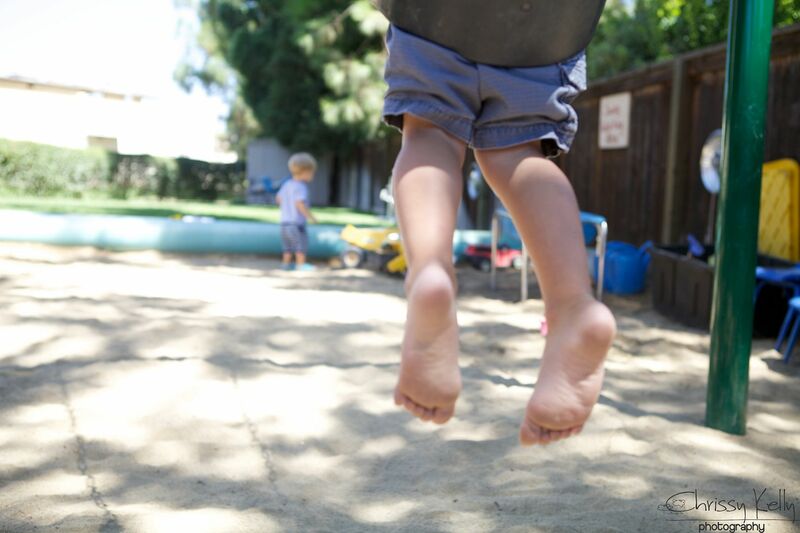 This blog is about you, and your husband and two amazing sons with super powers. Don't ever stop writing your heart here, because for every one who has an issue with your topic, there are thousands of us that love your topic, and come here to heal from our daily monotony as well. Frank is indeed your gift from God, never stop feeling what you do for him. I would go as far to say, he is family now, and we ALL write about the members in our families. My son who has autism is now 23. He is also blind and has medical issues. The internet was just beginning to allow glimpses into the homes of other smiles like ours when my Alex was a baby. We had a pretty easy time finding other parents of preemies, found connections with some who were raising children with no vision but not so many who wanted to share about living with autism. Autism had a stigma. Autism was less well understood by the public or the medical professionals. Thank you for being there for so many families who are looking for community in a bewildering and hard life journey. I would have loved to have had you there for me. I enjoy reading your blog and love the pictures you post. The tip toe picture in this post is my favorite. I like your insight and the perspective you take. Keep on sharing! I am so glad that I found this blog today. We take our 18 month old grandson for his first speech therapy evaluation tomorrow (with his Mom, our daughter). 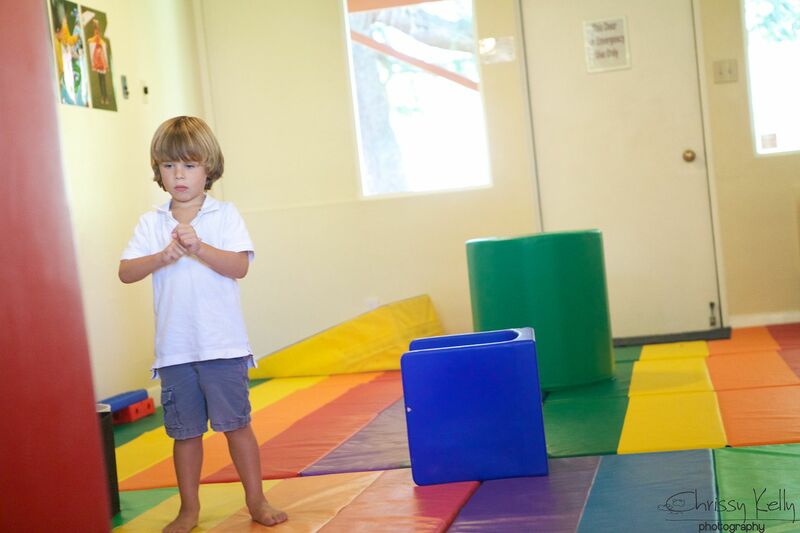 Even though no one has said the word "autism" to us yet (couldn't see a developmental pediatrician for three months), we have the gut feeling that at some point, someone will tell us that. Its been incredible to read your thoughts, feelings, insights into what our lives have in store for us as we start on this journey. Thank you for sharing and I look forward to checking in with you each day.